Who Was the Best Orator of All Time? When he created his guidelines for orators, the Roman philosopher Cicero claimed that great speeches should contain three things: technique, substance, and passion. Speakers should use classical techniques that emphasize logic and lyrical rhythm; they should speak with knowledge and moral purpose; and they should be able to project character and emotion when appropriate. In The Art of Great Speeches, Dennis Glover, a speechwriter for prominent Australian political, business and community leaders for nearly two decades, breaks down the key elements of classical and modern oratory to reveal the rhetorical techniques that make them memorable. He also takes a look at which orators throughout history have lived up to Cicero’s ideal. These are Glover’s picks for the greatest orators of all time. Take a look at their speeches; which one would you choose? Winston Churchill was the master of the middle style; he restrained emotion to emphasize argument and content. This was probably fitting for the House of Commons, where he delivered many of his speeches and where it was wise to be more politically charming than rousingly vigorous. In his “blood, toil, tears, and sweat” speech, given just after he became Prime Minister, Churchill spoke with simplicity and clarity. Yet he always managed to also speak artfully. In the famous line, “Never in the field of human conflict was so much owed by so many to so few,” you’ll find evidence of some classical rhetorical techniques that make it so memorable: anaphora (beginning successive phrases with the same word) and isocolon (two equal clauses of syllables joined by a conjunction). A devotee of the great orators throughout history, John F. Kennedy was especially a fan of Abraham Lincoln. He instructed his speechwriter, Ted Sorenson, to read through many of Honest Abe’s speeches. Going back to Aristotelian tradition, Kennedy often employed ethos, the notion that identifying with the values and beliefs of the audience creates a sense of community and trust. You can’t make a list of famous speeches without mentioning Martin Luther King, Jr.’s “I have a dream.” King’s background as a Baptist preacher gave him a solid foundation in the classical use of prose rhythm, evidenced here in the repeated iambic diameter of the speech’s signature phrase. What’s really impressive is that King made up some of that celebrated speech on the fly; the soul singer Mahalia Jackson, standing near the podium, called out for King to get out of his prepared speech and talk more about the dream, which King had referenced before in an earlier speech in Detroit..
King was also the master of metaphor, using the idea of his dream to stand in for a much larger vision of the future. He also brings in the element of pathos, suggesting that he might not live long enough to see that future, and bringing his audience closer to him emotionally. Making oratory cool again, Barack Obama gained notoriety for his speeches long before he was elected President. His skills at the podium made him a top contender in the primaries, but they were at their best in his 2008 election night speech. The speech revolves around the life of a voter in Atlanta, the 106-year-old Ann Nixon Cooper, going back through the country’s history to survey what she has seen in her lifetime. By ostensibly transforming his speech into a biography, Obama harnesses the strong emotional power that comes with personal stories and that has universal appeal. But he also is using praeteritio, a technique that avoids mentioning the man that the speech is really about—Obama himself. In this speech, perhaps the greatest impact comes from what is left unsaid. 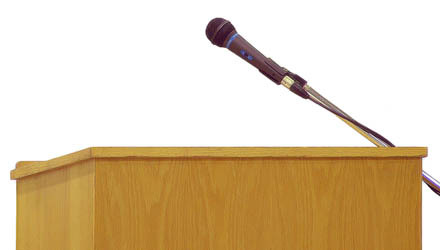 Who is your favorite orator, and what makes their speeches so powerful? Cast your vote in the poll below! Who is your pick for best all-time orator? Other – Tell us your favorite in a comment!